Port-au-Prince (Agenzia Fides) - The collapse of state institutions, the escalation of violence, armed gangs in the pay of powerful sponsors, the growing economic debacle leading to intolerable impoverishment, but also widespread corruption, arrogant impunity, mistrust, non-compliance respect for the sacredness of life and brazen attack on the dignity of the human person: these are the many ills affecting Haiti denounced with so many strong words by the Catholic Church of Haiti in its Christmas Message 2018 addressed to: priests, religious, lay faithful, men and women of good will. 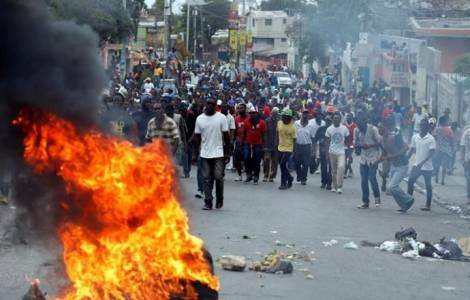 In a 14-point document sent to Agenzia Fides, the Episcopal Conference of Haiti makes its voice heard with regards to an alarming and increasingly tragic situation for the Haitian people. The Bishops recall that God "God does not let man rush back into the abyss of evil. He comes to his rescue to help him up from the depths of his fall". They highlight a reality marked by political and social failures and recall the effects of violent clashes among social groups: "How can we not say the horror and the terror that we have experienced before the revolting state of some victims mutilated and thrown to the adventure and the cesspool! To the grieving families, we still express our strong sympathies and we expect the perpetrators of these horrific crimes to be apprehended and brought to justice". "The Church - observes the text - calls for a sincere dialogue without demagogy. The Nation is digging the gulf of its annihilation. It is on this real, sincere and inclusive ground of dialogue that we propose to bring back the PetroCaribe dossier, (cause of the clashes, ed), to which we must give a concrete follow-up in the shortest possible time, both in its administrative aspect and in its legal aspect". Then they turn to the authorities: "You elected officials, at all levels of the state, your responsibility, as mandated by the people, is to do everything to stop this disturbing deterioration of Haiti. You are responsible for protecting the people and the democratic institutions of the country. You must renounce the undue and extravagant privileges that you accord to the detriment of the primary and vital needs of the people. You must act before it is too late". "You who are engaged in political parties and who work to conquer power , we remind you that power is a service. Therefore, you are called to silence your passions and personal ambitions so that it is the country that always wins". A word is addressed to the Haitan justice: "You who are invested with the judiciary, you are called to make the rule of law and justice in a system decried and deemed corrupt. Are you really aware of it? We call on your impartiality, independence, integrity and courage". Then an appeal to all the people: "You members of civil society, men and women of good will, sincerely love this country. Work honestly on its development. Your role is to contribute to the transformation of society. Also, you are asking us to resist any blindness, pressure, intimidation and manipulation". The Bishops send out a heartfelt cry: "Son and daughters of Haiti, all that we have just said to you will be a dead letter and a vain word as long as the venom of mistrust alters and distorts our relations. We must recognize that distrust, engendered by fear, reigns between us and hampers the advancement of our country. We must fight it. And this fight goes through the education of consciousness for a culture of truth, loyalty and probity. It allows us to become responsible citizens". The text concludes with a wish for Christmas 2018 and the new Year 2019: "to walk and come to a true pact of trust, and thus give real content to a new spring for our people. To Our beloved Mother, Our Lady of the Perpetual, we give this vow, so that through her intercession, it may come true". AMERICA/VENEZUELA - The Bishops call for the entry of "humanitarian aid"